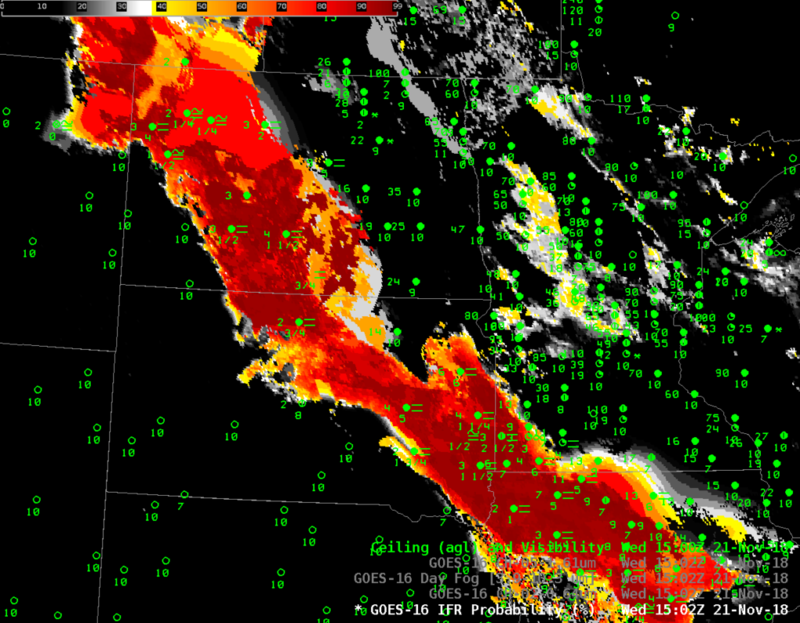 An intense early Spring storm produced blizzard conditions over the western Great Plains on 13 March 2019 (See this blog post for example). The southerly flow in advance of the storm moved moist air over a dense snowpack over the upper Midwest, resulting in dense Advection Fog. 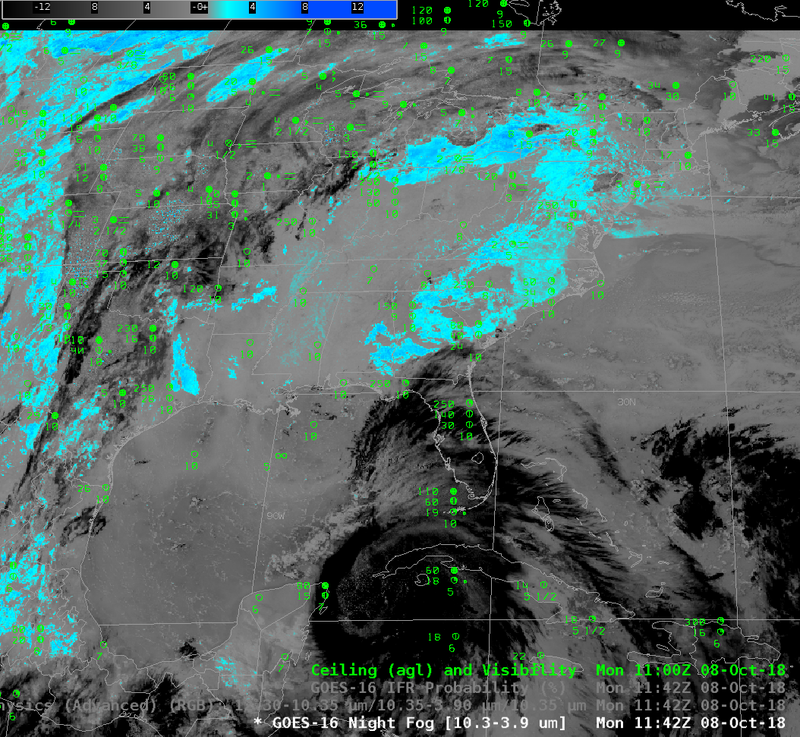 The animation above cycles between the Night Fog Brightness Temperature Difference (10.3 µm – 3.9 µm), the Advanced Nighttime Microphysics RGB that uses the Night Fog Brightness Temperature Difference as the ‘green’ and GOES-16 Low IFR Probabilities. 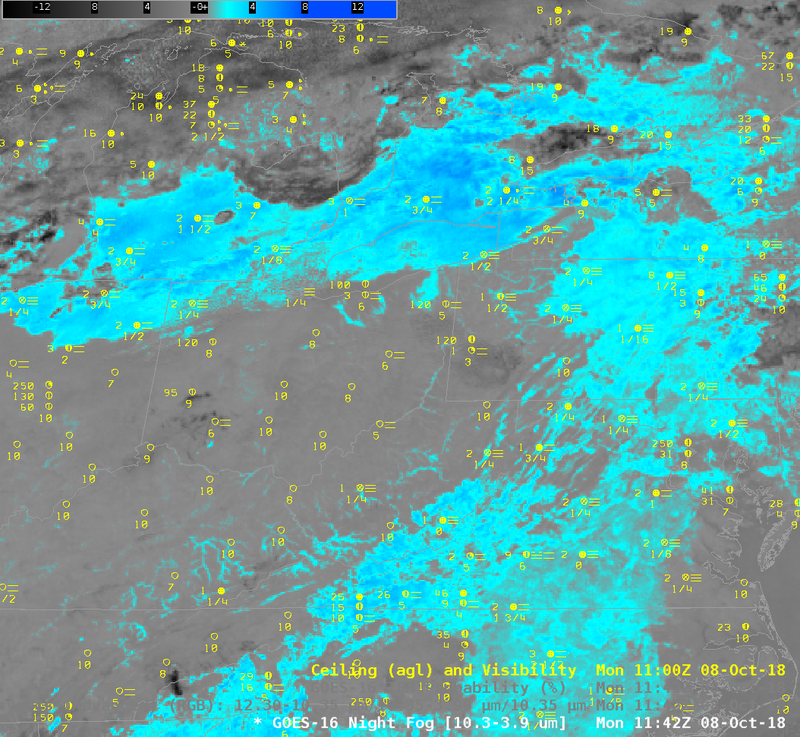 At 0837 UTC, high clouds had not yet covered all of the upper Midwest, and the satellite still viewed stratus clouds over Wisconsin and Minnesota (bright cyan in the Night Fog Brightness Temperature difference enhancement). 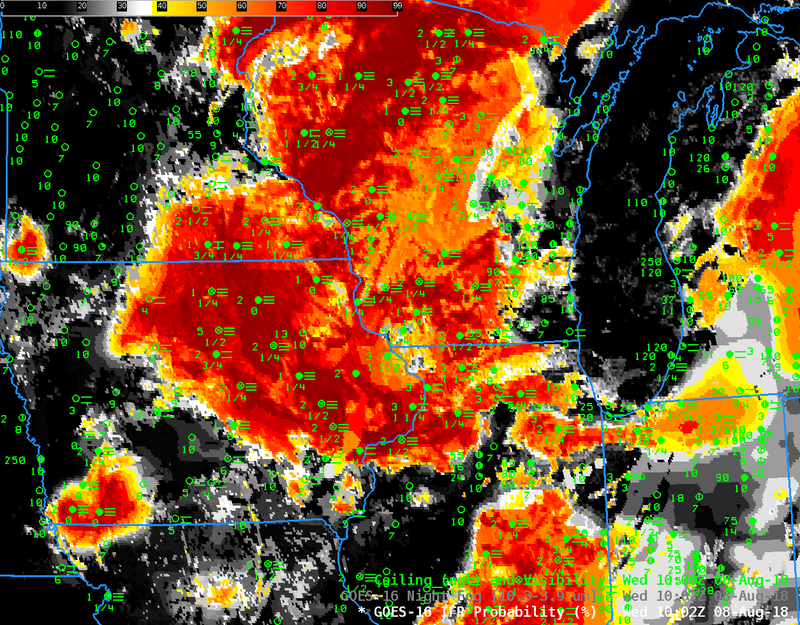 Note the difference in the Low IFR Probability field in regions where high clouds are present (Iowa and states to the south and west) and where they are not. 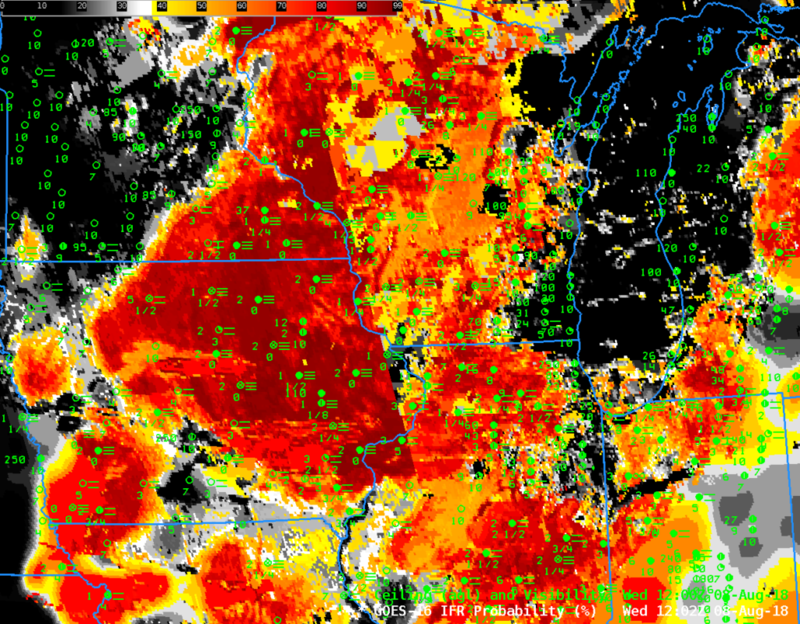 Low IFR Probability has a pixelated look over Wisconsin because modest satellite pixel-level variability is included in the IFR probability field. 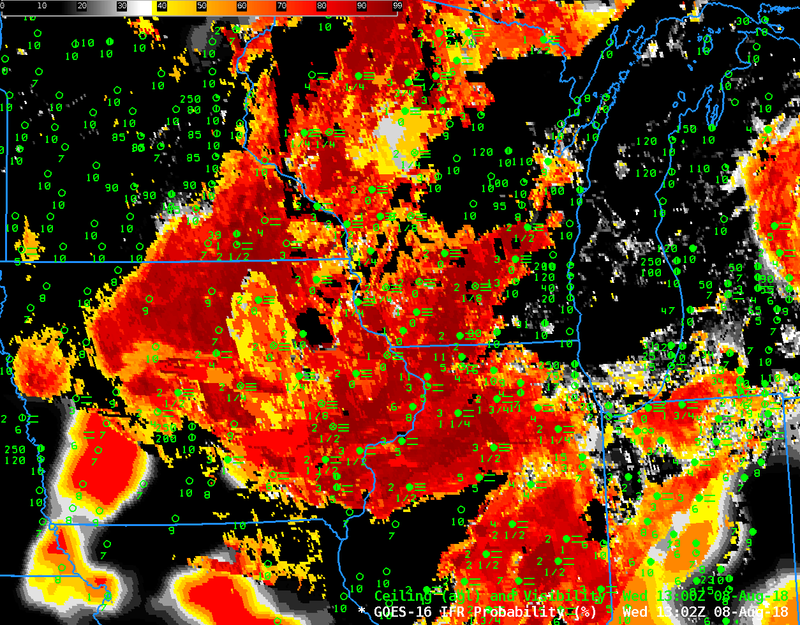 Over Iowa, in contrast, satellite data gives no information about reductions to visibility under the thick cloud cover; low-level data from the Rapid Refresh model drives the Low IFR Probability field there. 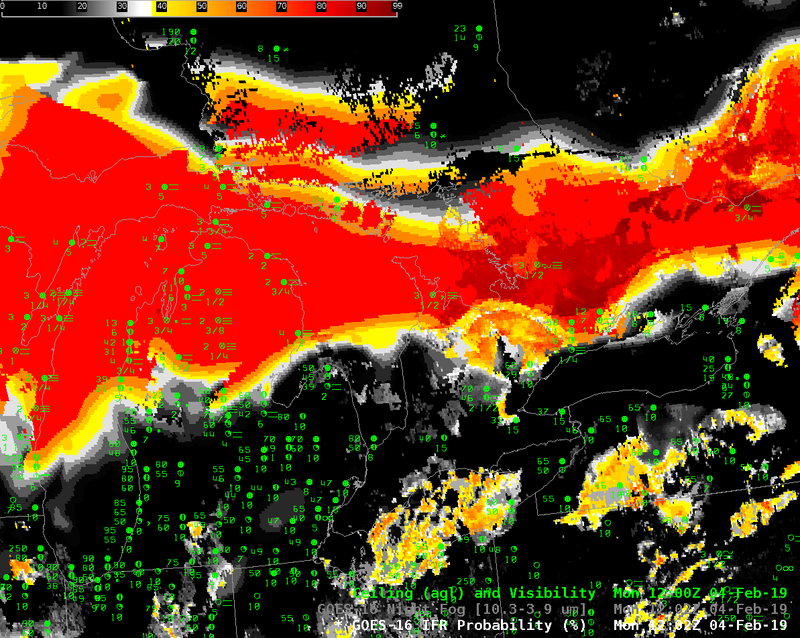 Probabilities are high in regions where observations suggest IFR/Low IFR conditions are present. 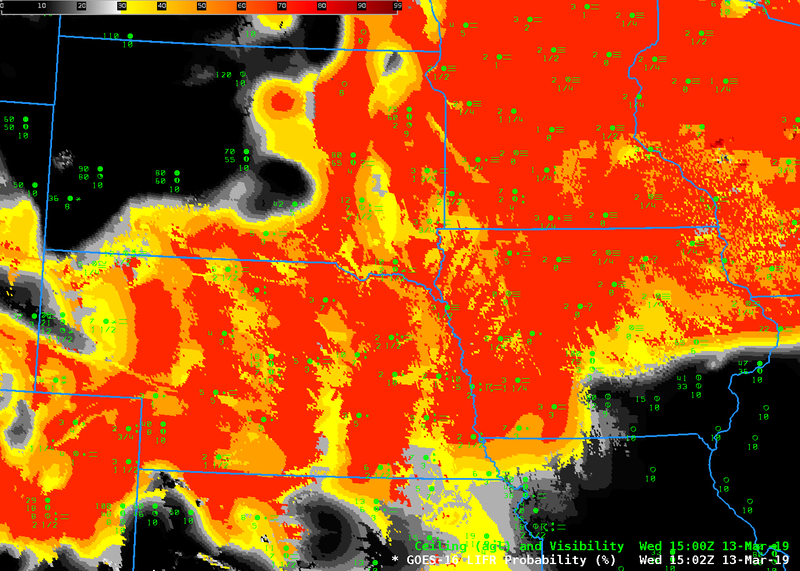 This suggest the Rapid Refresh is simulating the evolution of the atmosphere well over the Plains. 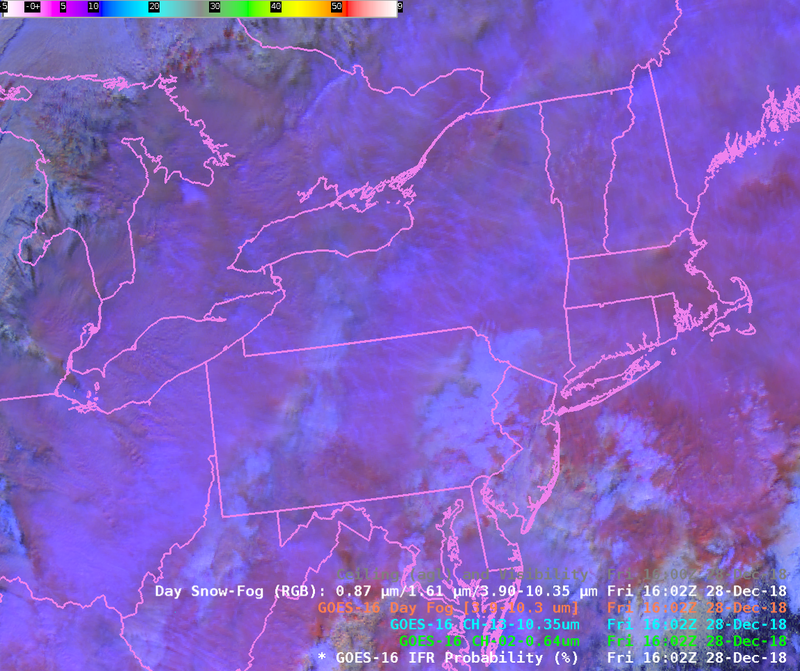 The Advanced Nighttime Microphysics RGB can detect low clouds — but only when high clouds are not in the way. 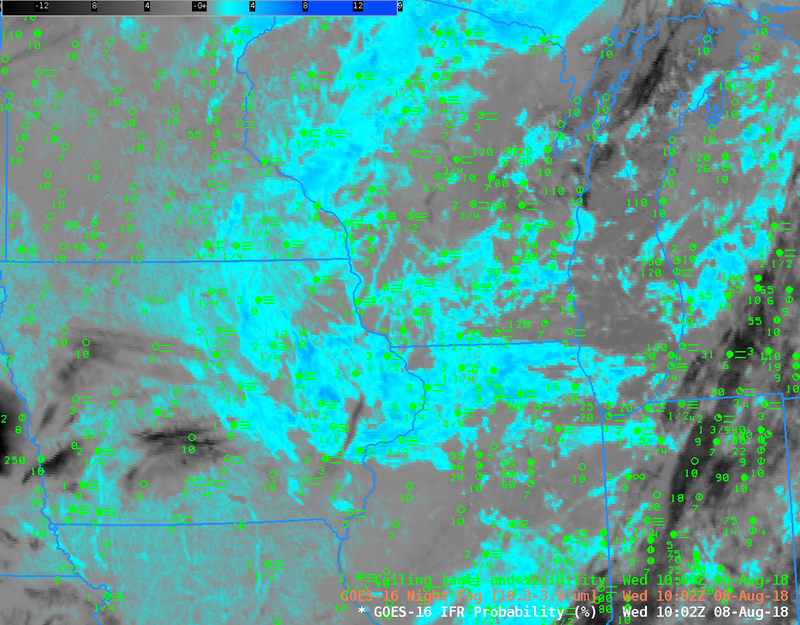 For this case, the RGB signal over Wisconsin is consistent with stratus and fog, but over Iowa the signal is consistent with cirrus that is occurring there. 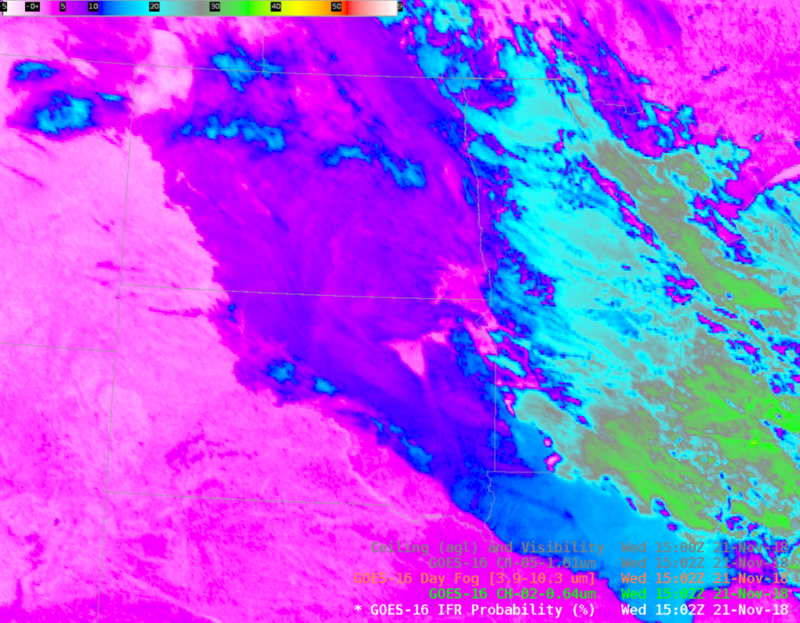 Surface restrictions in visibility and lowered ceilings are similar in the two states, and the IFR Probability field has similar values in the two states. 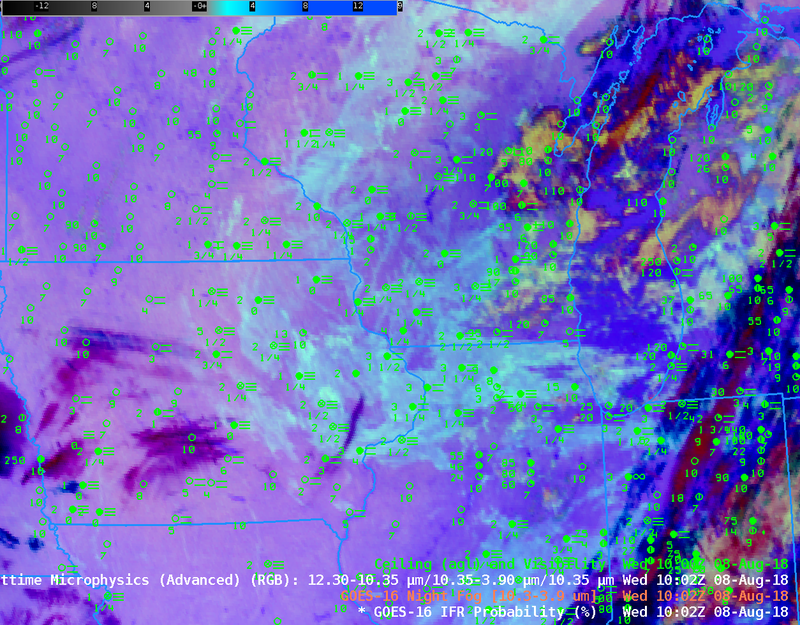 By 1502 UTC on 13 March (below), high clouds had overspread the entire Midwest; Low IFR Probability relies almost entirely on Rapid Refresh Model estimates of low-level saturation. 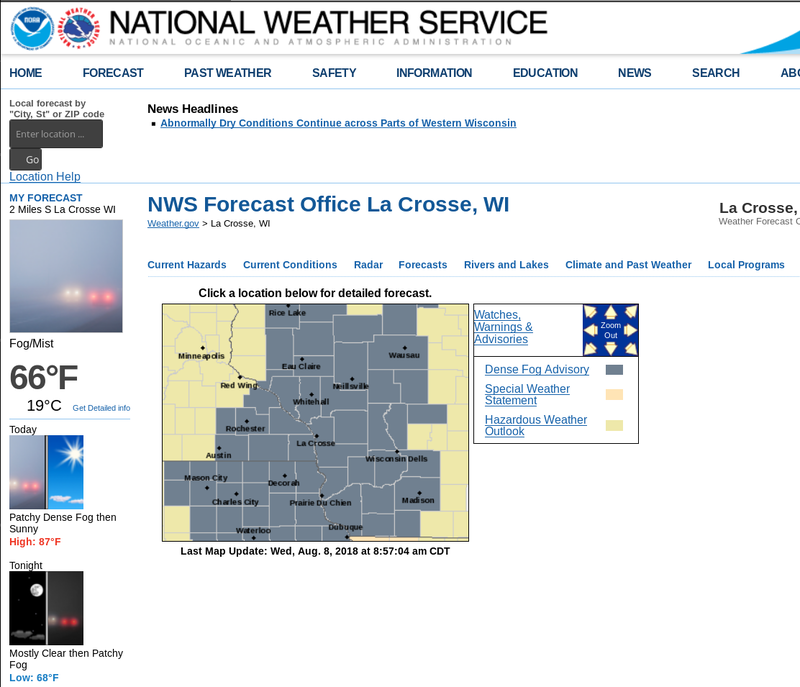 That is why the field over northern Minnesota and northern Wisconsin is flat. 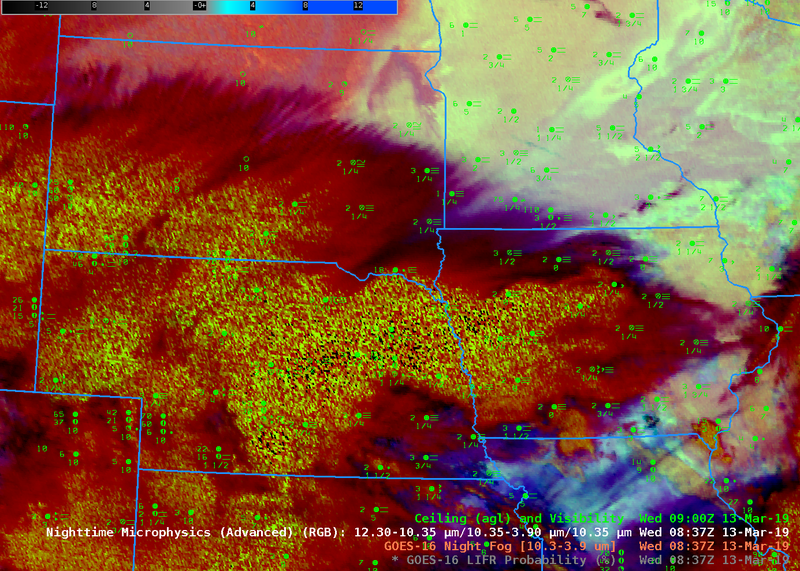 Some holes in the high clouds are suggested by the pixelated look of the field in Iowa and southern Wisconsin. 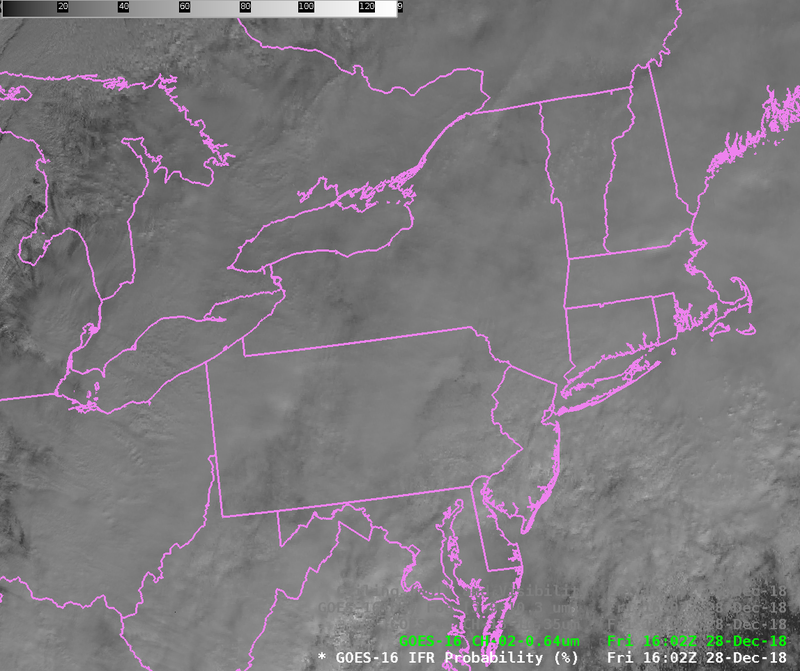 This entry was posted in GOES-16, Multiple Cloud Layers on March 13, 2019 by Scott Lindstrom. GOES-16 Night Fog Brightness Temperature Difference (10.3 µm – 3.9 µm), Nighttime Microphysics RGB and GOES-16 IFR Probability at 1116 UTC on 22 February 2019; Surface observations of ceilings and visibilities at 1100 UTC are also plotted (Click to enlarge). 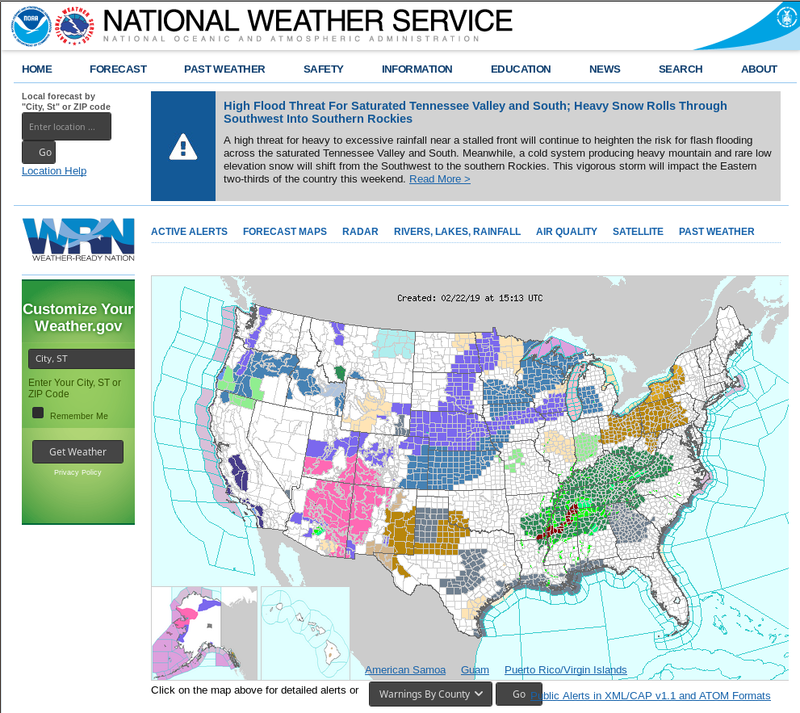 A strong storm embedded within a subtropical jet stream over the southern United States was associated with widespread fog on the morning of 22 February 2019. 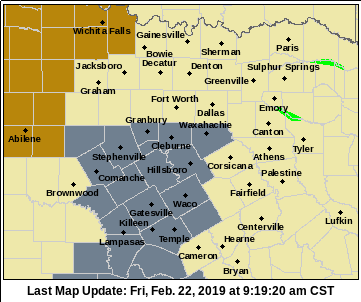 This screen-capture from this site shows Dense Fog Advisories over much of Georgia, and over regions near Dallas. 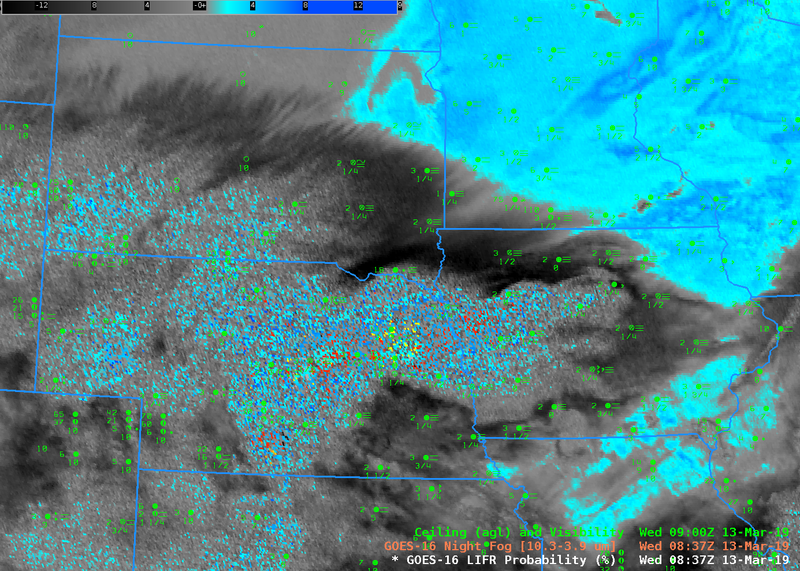 Which products allowed an accurate depiction of the low ceilings and reduced visibilities? 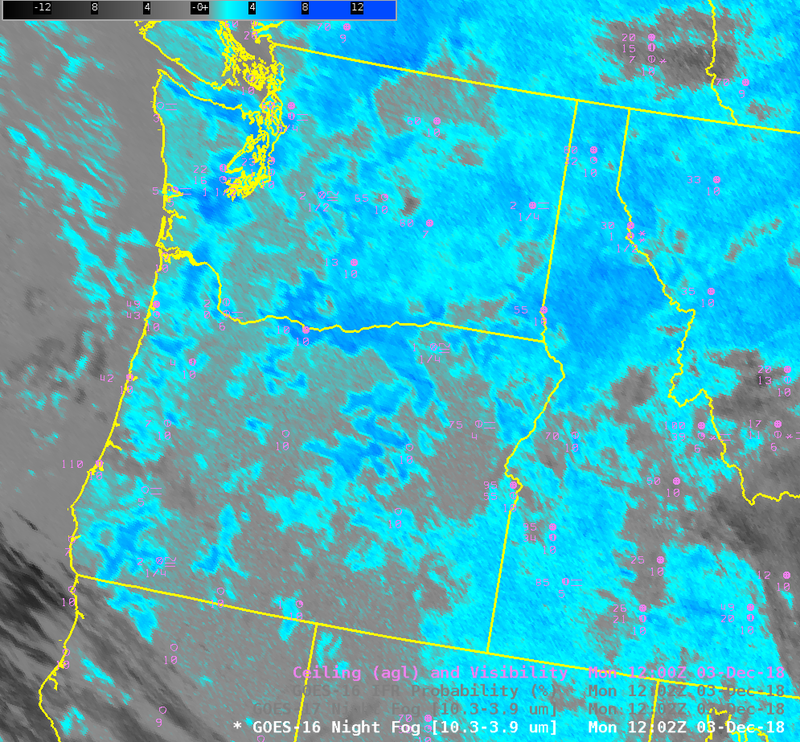 The toggle above cycles between the Night Fog Brightness Temperature Difference (10.3 µm – 3.9 µm), which product identifies low clouds (cyan blue in the default AWIPS enhancement shown) because of differences in emissivity at 3.9 µm and 10.3 µm from small water droplets that make up stratus clouds, the Nighttime Microphysics RGB, which RGB uses the Night Fog Brightness Temperature Difference as it green component, and the GOES-16 IFR Probability product. 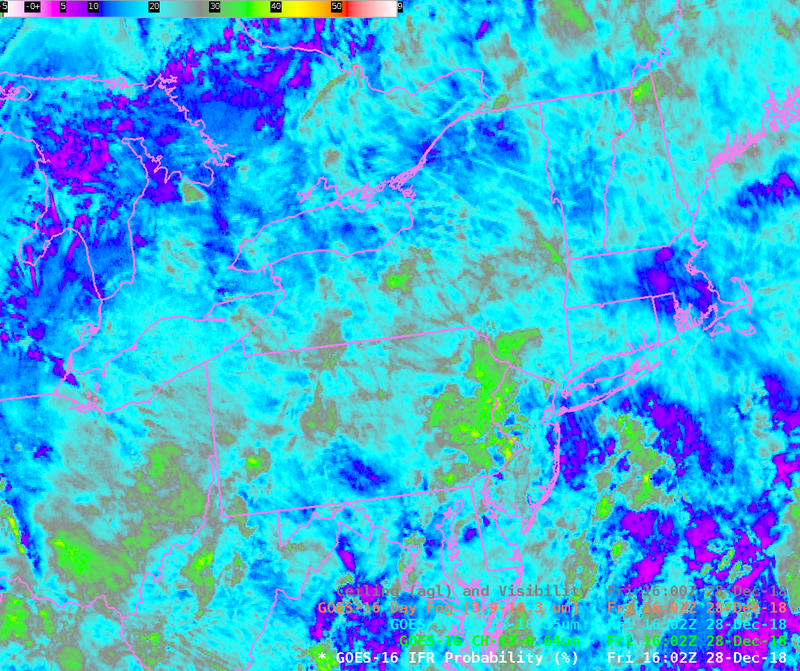 IFR conditions are defined as surface visibilities between 1 and 3 miles, and ceiling heights between 500 and 1000 feet above ground level. The plotted observations help define where that is occurring. 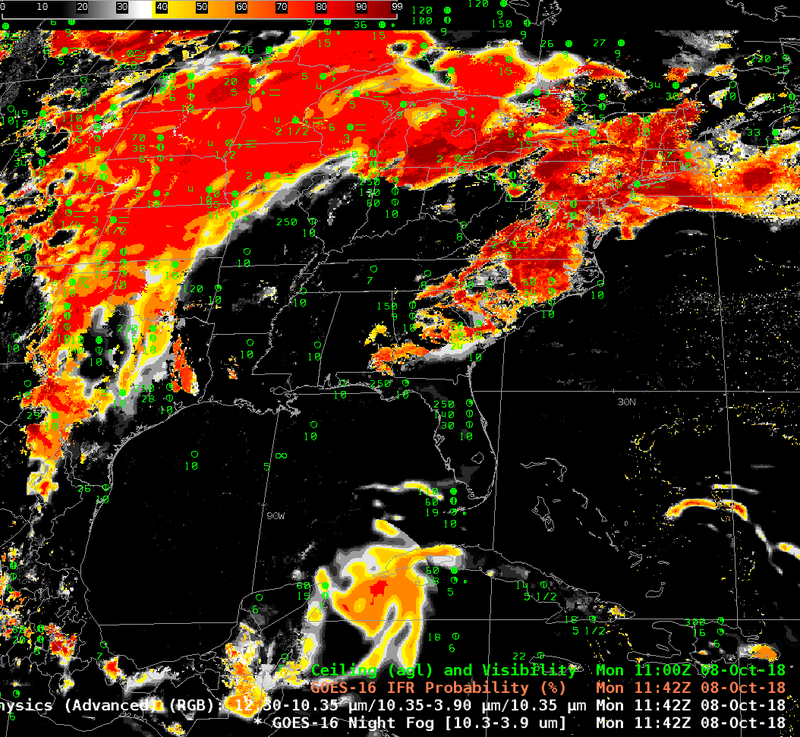 Multiple cloud layers from Arkansas east-northeastward make a satellite-only detection of IFR conditions challenging. 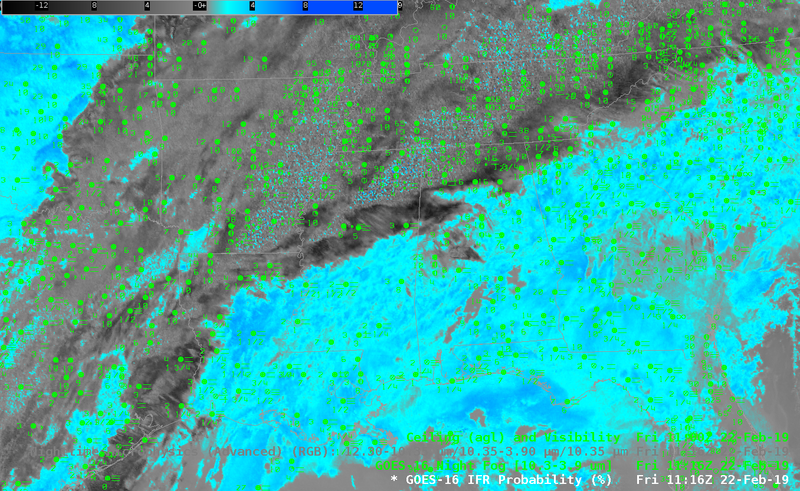 IFR Probability gives useful information below cloud decks because model-based saturation information from the Rapid Refresh Model fill in regions below multiple cloud decks where satellite information about low clouds is unavailable. 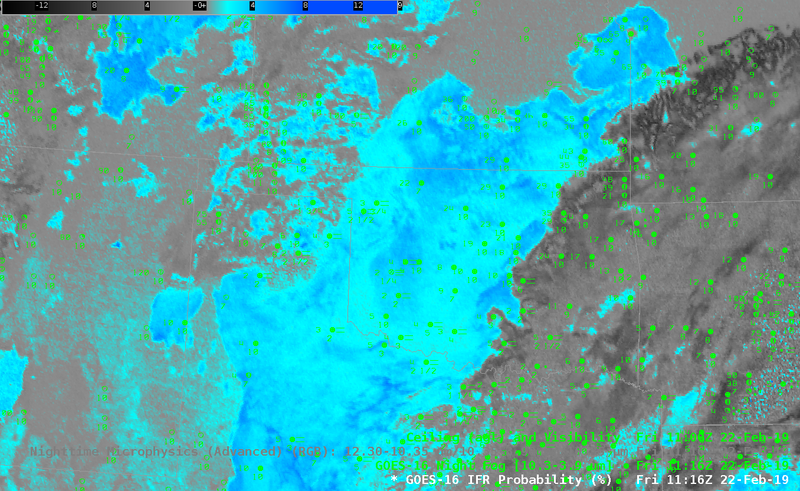 The toggle below shows the same three satellite-based fields (Night Fog Brightness Temperature Difference, Nighttime Microphysics RGB and IFR Probability) at the same time, but centered over Oklahoma. 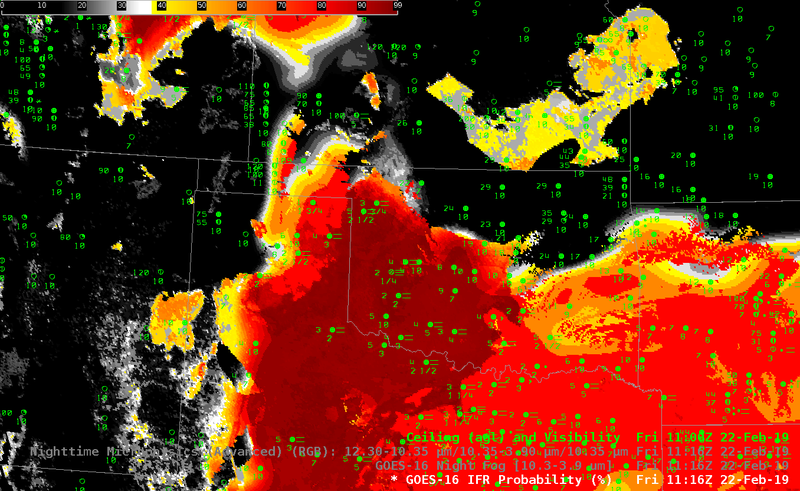 In this case, the Rapid Refresh Data are used to screen out a region of elevated stratus over northeast Oklahoma. 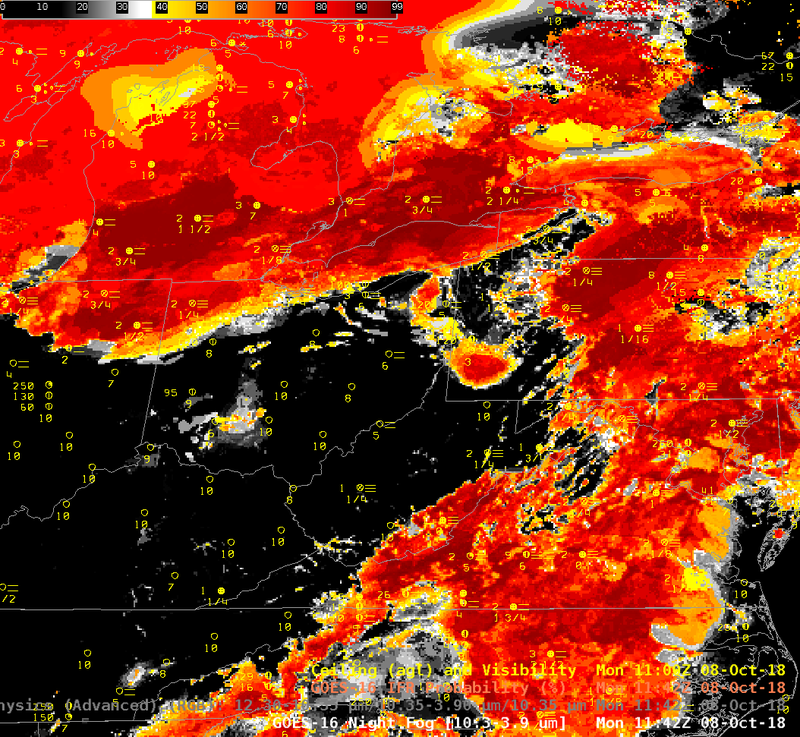 Note that these is little in the Night Fog Brightness Temperature Difference field to distinguish between the IFR and non-IFR locations. 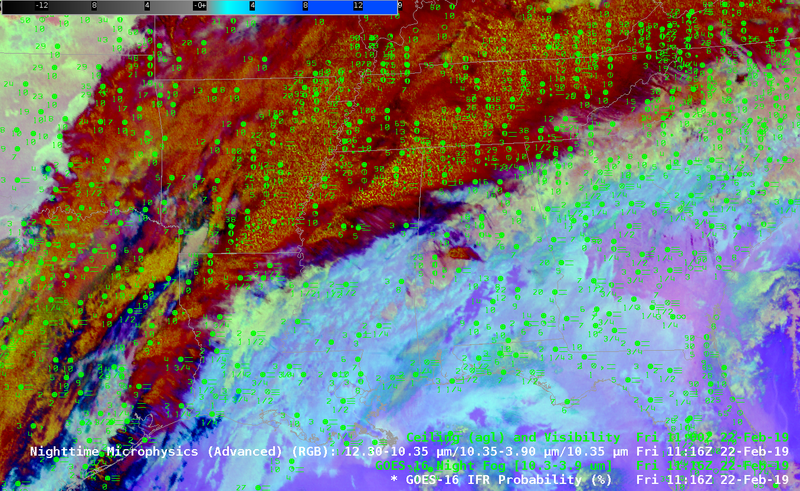 GOES-R IFR Probability over the southeast United States in this case is identifying regions of IFR conditions underneath multiple cloud decks (and also where only the low clouds are present) by incorporating low-level saturation information from the Rapid Refresh model. 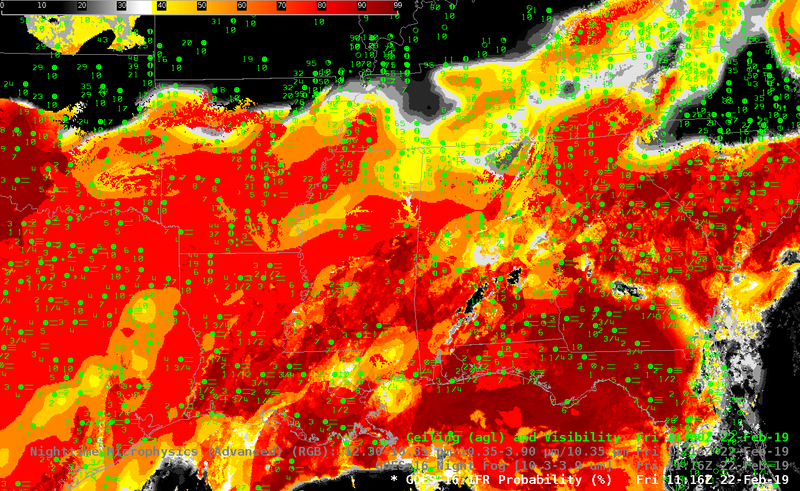 Over Oklahoma, non-IFR conditions under an elevated stratus deck are identified (and screened out in IFR Probability fields) by the lack of low-level saturation information in the Rapid Refresh. 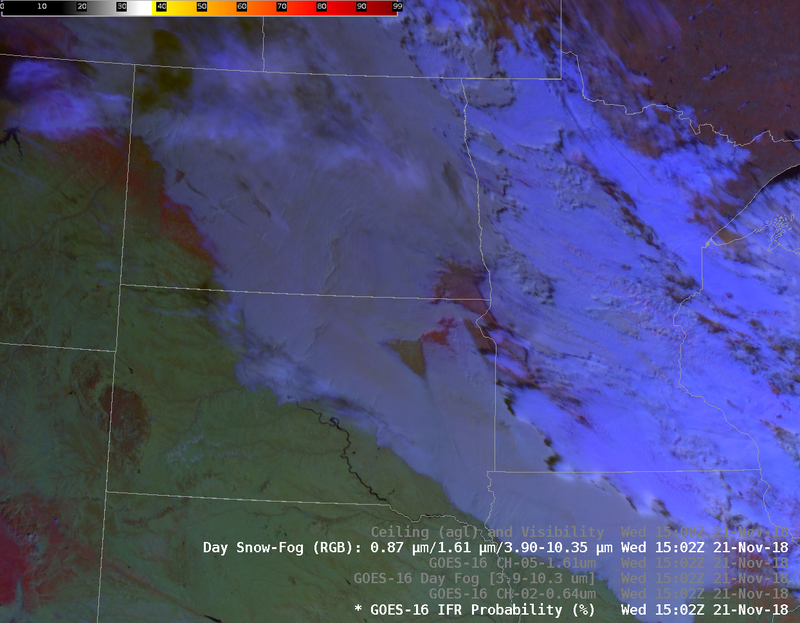 This entry was posted in GOES-16, Plains, Southeast, Texas on February 22, 2019 by Scott Lindstrom. When smoke covers a geographic region, visible detection of low-level fog is difficult because smoke can scatter or obscure the signal from the low-level clouds. 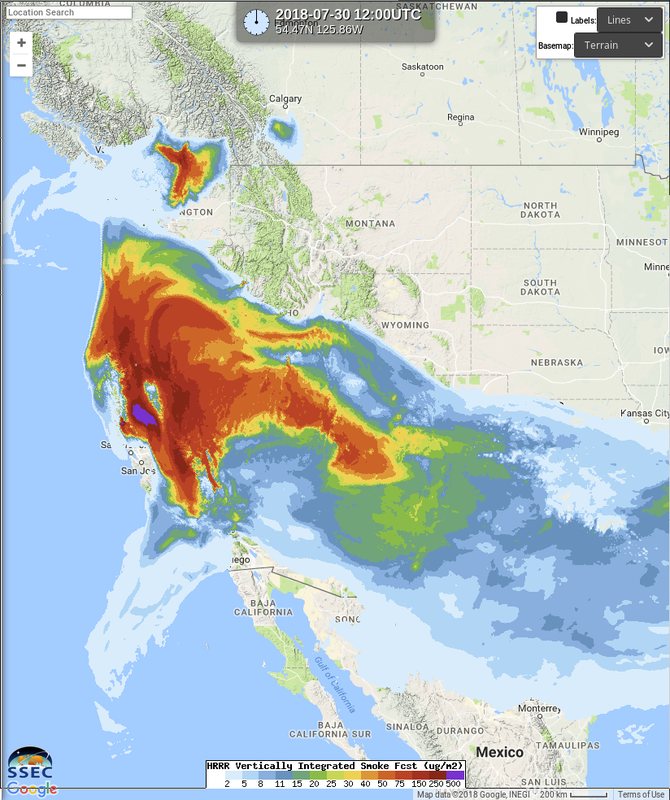 The image above shows a Vertically Integrated Smoke Forecast from a High-Resolution Rapid Refresh Model simulation in Real Earth (link). 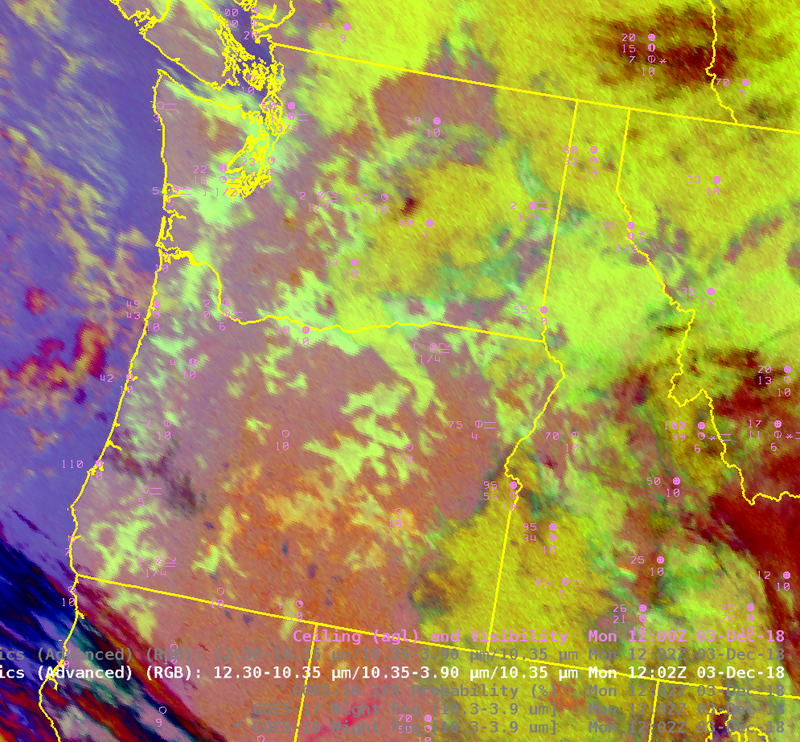 Thick smoke was predicted to occur over the coast of Oregon. 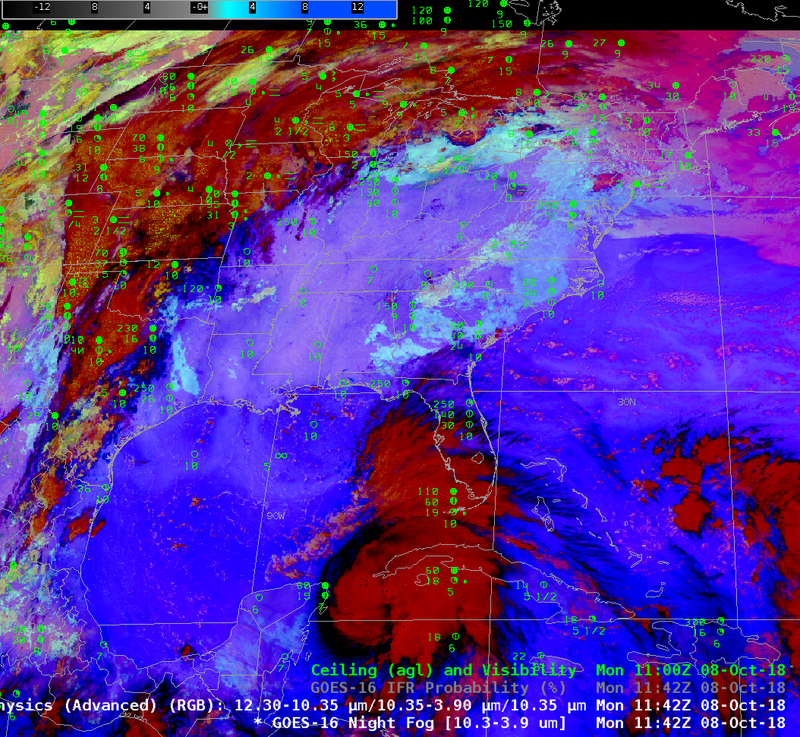 The animation below steps through the GOES-R IFR Probability, and then the ‘Blue Band’ (0.47 µm), the ‘Red Band’) (0.64 µm), the ABI channel with the highest spatial resolution, the ‘Veggie Band’ (0.86 µm) and the ‘Snow/Ice Band’ (1.61 µm). 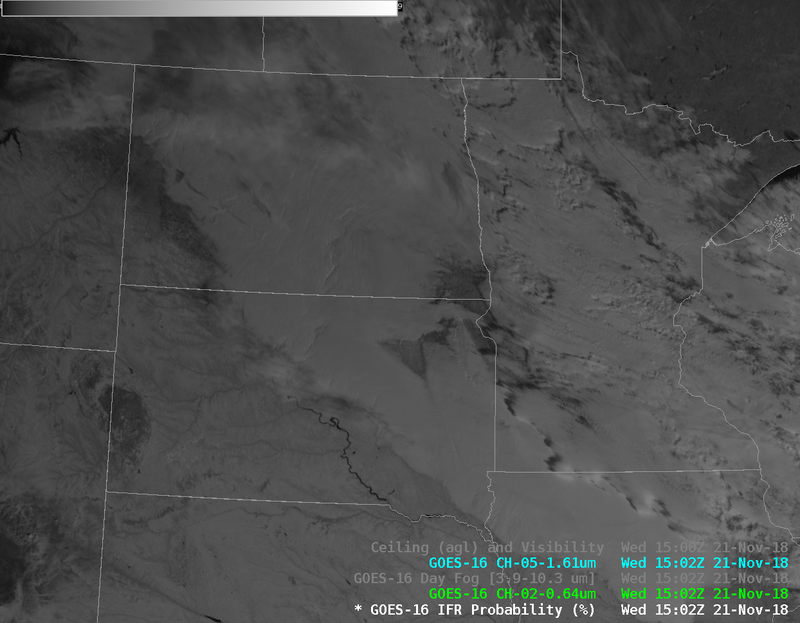 Two things of note: Because of the low sun angle, and the enhanced forward-scattering properties of smoke at low sun angle, it is very hard to detect fog through the smoke in the visible wavelengths near Sunrise. As the wavelength of the observation increases, scattering is less of an issue. 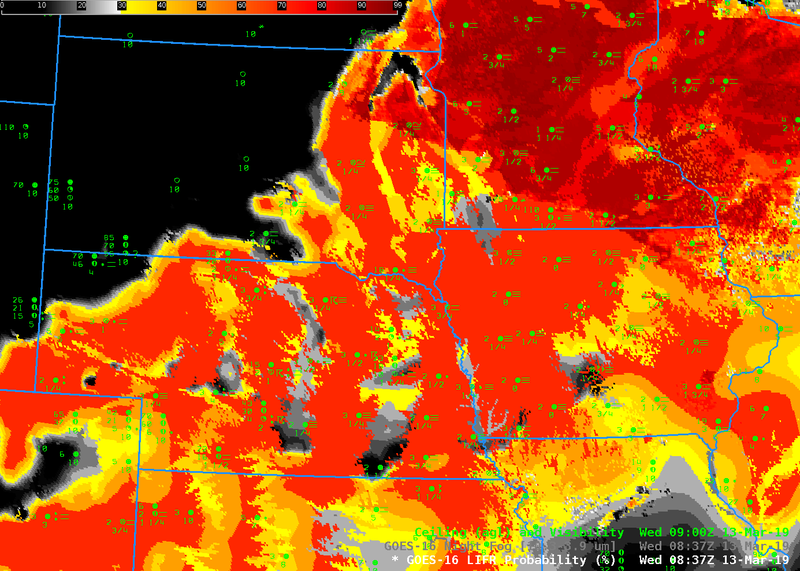 In addition, smoke is more transparent to longer wavelength radiation. 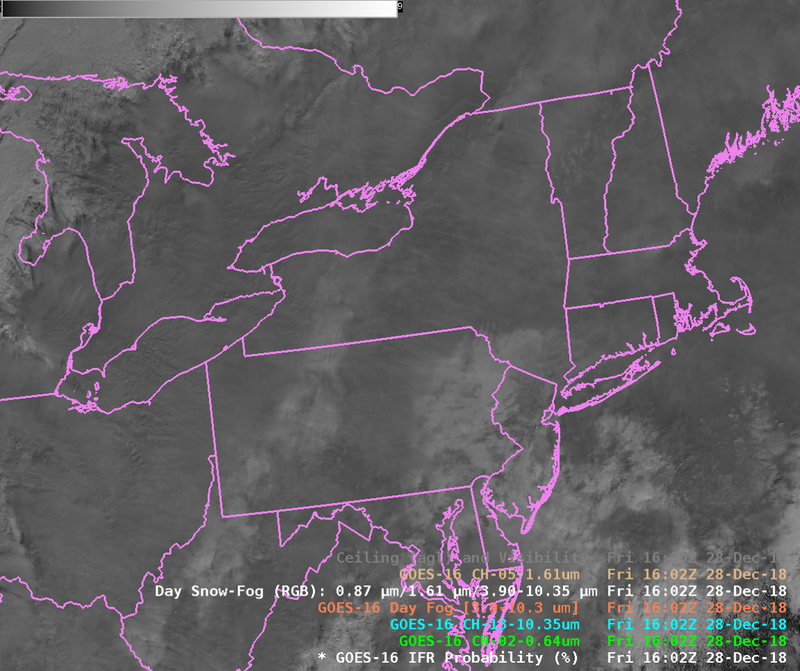 Thus, the cloud edges become more apparent under the smoke in the 0.86 µm and especially the 1.61 µm imagery compared to the visible. 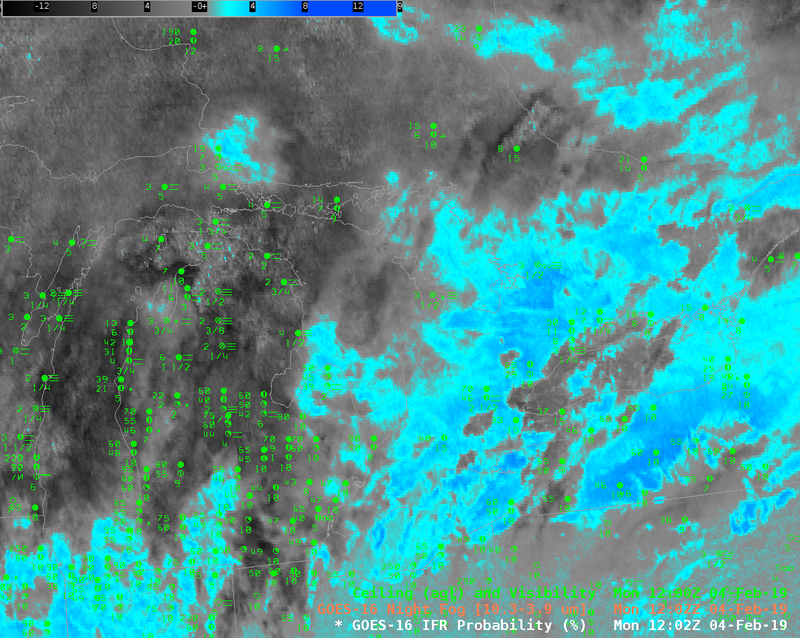 GOES-16 IFR Probability can indicate the regions of fog and corresponding restrictions in visibility because it relies on longer wavelength observations from GOES-16 (3.9 µm and 10.3 µm, principally) and information about low-level saturation from the Rapid Refresh model. 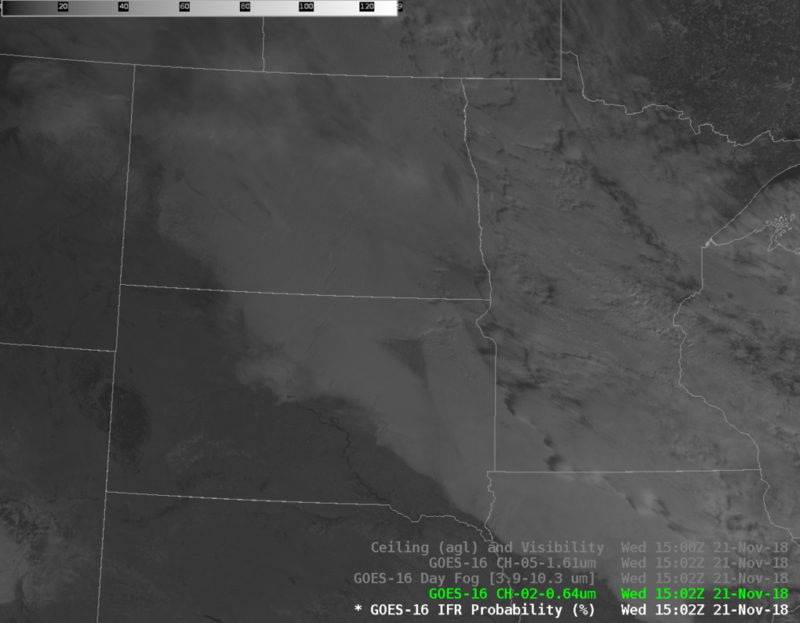 Smoke is mostly transparent to radiation in the infrared unless it becomes extraordinarily thick (indeed, that is one reason why smoke is difficult to detect at night); thus, the brightness temperature difference between the shortwave (3.9 µm) and longwave (10.3 µm) infrared channels on GOES-16’s ABI can highlight cloud tops made up of water droplets that occur underneath elevated smoke. As the Sun gets higher in the sky, fog edges beneath the smoke become more apparent because forward scattering decreases. The animation below of the visible confirms this. 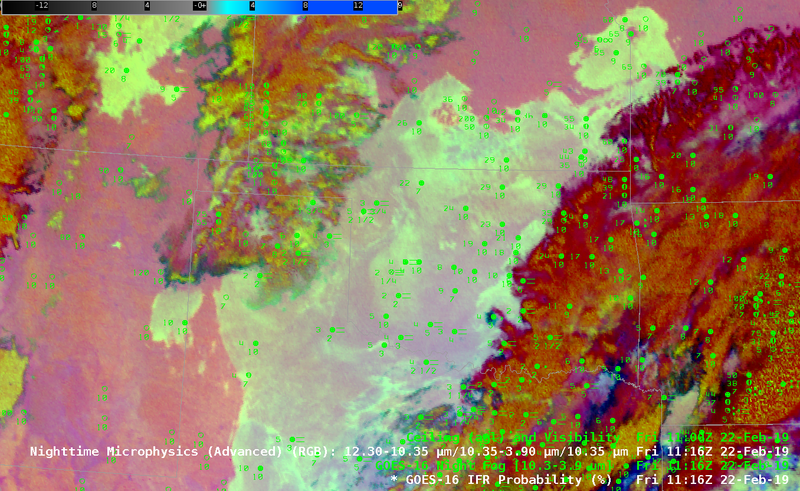 In contrast, the fog edge in the IFR Probability is well-represented during the entire animation (although the horizontal resolution of the infrared channels on GOES-16 (at the sub-satellite point) is only two kilometers vs. 1/2-km for the Red Visible). 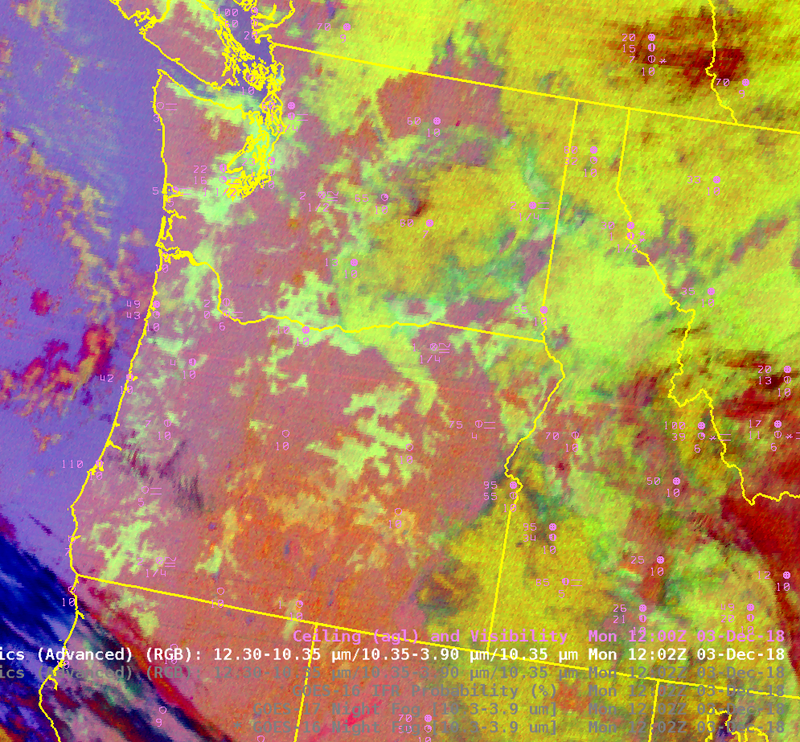 Note that IFR conditions are also occurring during this animation due to smoke over southwest Oregon. 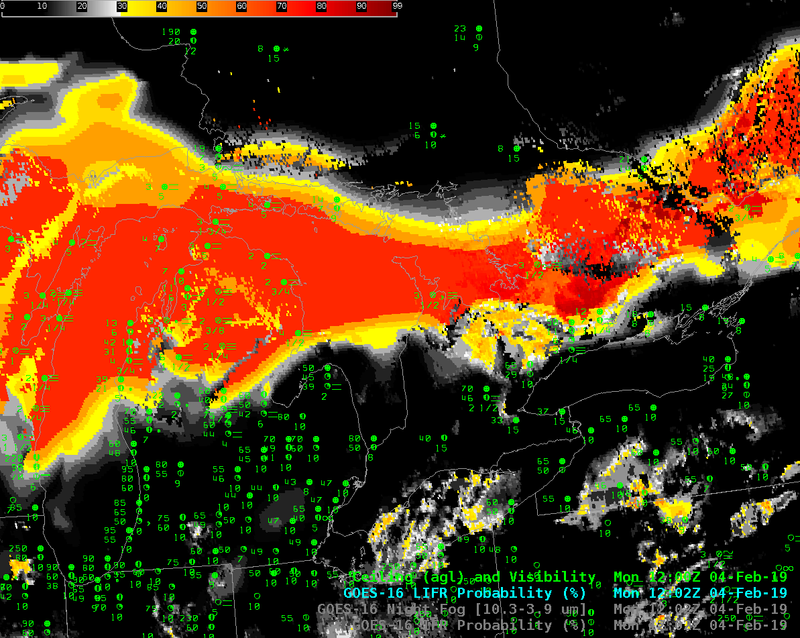 GOES-R IFR probability detects only cloud-forced IFR conditions, but not IFR conditions because of thick smoke only. 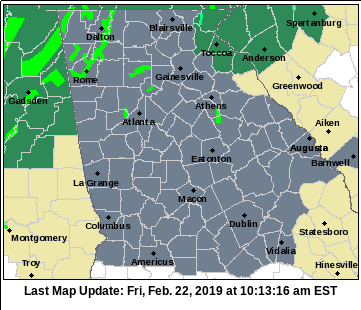 Again, this is because smoke detection in the infrared is a challenge for ABI Channels and Rapid Refresh Model output does not as yet predict visibility restrictions due to smoke. 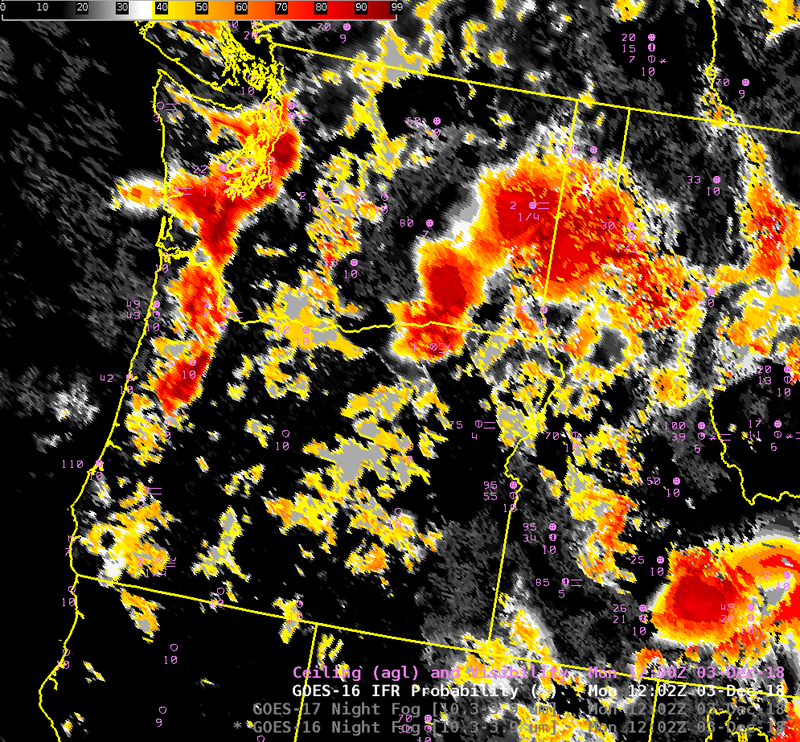 This entry was posted in GOES-16, Pacific Northwest on July 30, 2018 by Scott Lindstrom.